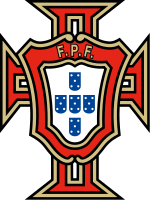 The Portuguese Football Federation (Portuguese: Federação Portuguesa de Futebol; FPF; pronounced [fɨdɨɾɐˈsɐ̃w̃ puɾtuˈɡezɐ dɨ futɨbɔɫ]) is the governing body of football in Portugal. It organises the Campeonato de Portugal, the Taça de Portugal, the Supertaça Cândido de Oliveira, youth levels, women's football, beach soccer, futsal, and also the men's and the women's national football teams. Formed in 1914, it is based in the city of Oeiras. Below is a list of all the 30 presidents of the Portuguese Football Federation (previously Portuguese Football Union), from 1922 to date. ^ a b "History". FPF. Retrieved 4 July 2016.